Sure, holidaying with the kids is great fun, but sometimes nothing beats an adults-only getaway with your significant other. Should the mood strike, leaving you yearning for an impromptu getaway atop the high seas, our guide to the best ships for an adults-only cruise will help you plan the childfree trip you’ve been dreaming of. With its large volume of exterior balcony staterooms, Sun Princess is one of those rare cruise ships where passengers can escape the crowds and enjoy a day or two of complete relaxation and tranquillity. When you’re ready to emerge from your private cabin, the ship’s charming public spaces prove highly couple-friendly – lending themselves perfectly to romantic dinners and intimate evenings in the piano bar. The opulent décor and attentive crew of Azamara Quest may be wasted on the young, but we’re confident adults will appreciate the luxury trimmings aboard this petite cruise vessel. Akin to a boutique hotel, Azamara Quest thrills thanks to its sophisticated atmosphere and off-the-beaten-path destinations – not to mention its elegant nightlife and sublime dining options. Recognising that some cruise-goers prefer a childfree atmosphere, Celebrity Cruises have gone to great lengths to provide the best of both worlds for its new and repeat cruise passengers. Like many ships in the Celebrity fleet, Celebrity Solstice features several areas strictly reserved for adults, including a full-sized pool, lounge bar and well-equipped spa. With lavish trimmings and olde-worlde charm aplenty; Cunard’s fabulous flagship, Queen Mary 2, gives adults a great excuse to ditch the kids for a week or two of opulence atop the high seas. Famed for its rich furnishings and terrific attention to detail, this commanding vessel delivers the classic cruise experience for adults keen to sail the open waves in complete comfort and style. From its intimate proportions to its adults-only pool and hot tub, Norwegian Jewel is the proverbial jewel in the crown of Norwegian Cruise Line’s adult-friendly fleet. Characterised by its colourful livery, this ship boasts some of the most cavernous cabins at sea and travels to some of the world’s most exciting destinations – including Alaska, the Pacific Islands and the Mexican Riviera. Like Queen Mary 2, Holland America Line’s MS Noordam embraces the nostalgic; its museum-quality art installations, 17th century Baroque columns and all-round good looks hark back to a bygone era. That’s not to say it’s lacking in contemporary innovations however. From its diesel electric engines to its array of soulful cocktail bars, Noordam is a vessel which blends the old and the new; something that’s sure to prove a captivating prospect for couples seeking solace from their offspring. As one of Australia’s best-loved family cruise lines, you’d be forgiven for placing P&O as the least likely line to book with for an adults-only cruise trip. After the launch of twin ships Pacific Aria and Eden however, P&O may well be the best option for a childfree cruise. Why? These new, state-of-the-art vessels feature “The Oasis” – an expansive adults-only area complete with private day beds, pool, hot tub and luxurious spa facilities. With a name like ‘Seabourn Sojourn’, adult-sized cruise-goers can expect great things from this cosy seafarer. From its multitude of private enclaves to its dimly lit cocktail lounges, Sojourn has the air of a ship that’s comfortable being labelled posh, exclusive and high-class. If you want to experience luxury at every stage of your cruise journey, Seabourn could well be the cruise line for you. 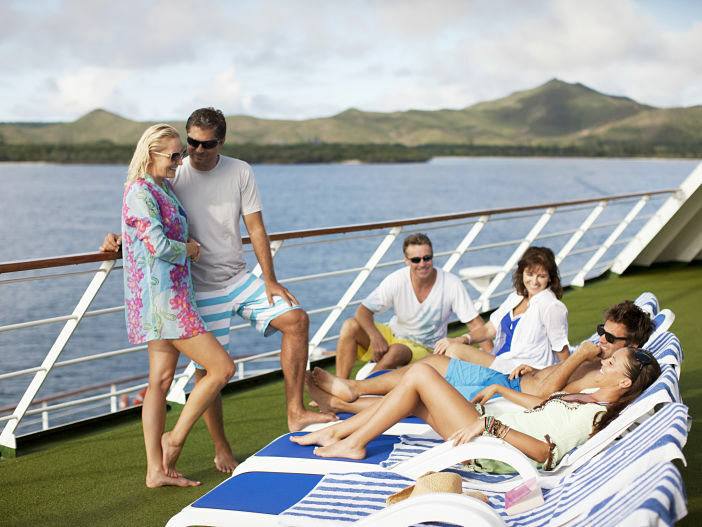 For a complete range of upcoming cruise breaks, visit the Cruise1st Australia website or call us on 1300 857 345. Images sourced via Flickr Creative Commons and P&O Cruises. Credit: Thomas Quine, DnlRxn, David Fiske, Tom Mascardo, Richard Martin, Andrew Malone, Josh Friedman P&O Cruises.